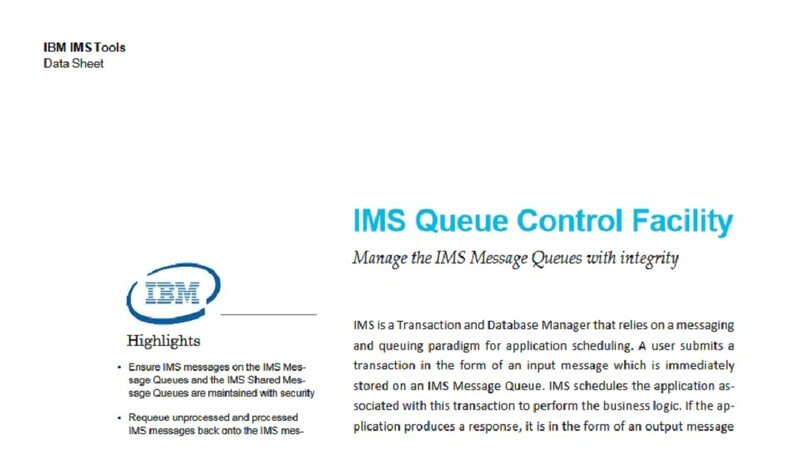 IBM® IMS™ Queue Control Facility for z/OS® is an IMS queue management tool that manipulates the local, live IMS message queues in both the shared and non-shared queue environments. In either environment, it can query, browse, load, unload and reprocess messages. IMS Queue Control Facility prevents queue overflow conditions in the non-shared queue environment and restores messages on the message queues for processing. It allows different IMS Queue Control Facility functions to run on multiple central electronics complexes (CECs) within a sysplex with other IMS Queue Control Facility servers. Allows different IMS Queue Control Facility functions to run on multiple central electronics complexes (CECs) within a sysplex with other IMS Queue Control Facility servers. Automatically identifies an IMS cold start and initiates the requeue of the messages that were in the queue before the cold start. Automatically senses an IMS warm start and initiates the requeue of the messages or offloads the messages that were in the dead letter queue before warm start. Provides a Queue Space Utilization Notification mechanism that lets you define up to ten areas of the total queue space to monitor for small or large messages.